Eye bag surgery or eye bag removal refers to surgery of the lower eyelid which can be troubled by excess fat and skin, known as fat herniation. Affecting women of all ages, eye bags can be hereditary, as well as occurring as part of the ageing process. They can also often be the result of the weakness of the septum and muscle and not excess fat! The ideal procedure is to carry out surgery where the fat is repositioned, the septum tightened, the eye muscle plication (tightened) and some excess skin removed. There is an accepted technique where removal of fat is an option, although at the Wentworth Clinic we discourage this procedure as it may result in sunken eyes in 5-10 years time. As part of our blepharoplasty procedures, we perform a surgery known as ‘septal reset’ in which excess fats are not removed but repositioned to achieve a long-lasting, transforming outcome. Many of our patients combine eyelid surgery and eye bag removal to achieve the most pleasing results. As with 90% of our cosmetic surgery procedures, eye bag removal can be performed under local anaesthetic with oral sedation, though in some cases your surgeon will deem general anaesthetic as the most appropriate option. For further information about eye bag removal for women, our procedure, and post-treatment care, please see below. Or please do contact us via telephone or online contact form and one of the Wentworth team will respond to further discuss your treatment plan with you. Our Consultant will assess your suitability for eye bag removal and for the type of surgery. The benefits and complications of the surgery will be discussed with you. A transconjunctival incision (inside the eyelid) is normally suitable for young patients and for those patients who are prone to excessive scar formation. 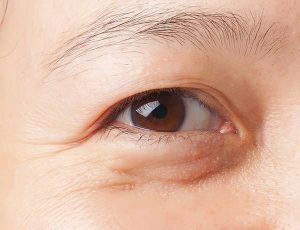 The subciliary (exterior) incision is useful for patients needing muscle plication (tightening) and removal of excess skin. You must expect swelling, bruising and some discomfort! Following surgery it would be best to keep your head elevated for a few days to reduce swelling. This may reach its maximum 48 hours after surgery. Cold compresses can also help. (Place crushed ice in a plastic bag and wrap gauze around. This will prevent your tapes from getting wet.) The surgeon will normally apply some suture strips or steri-strips as support to the eyelids after surgery and if these become crusted they can be replaced. There may be some discomfort following surgery and prescribed painkilling medication or Paracetamol may be taken as instructed on the packet. Do not take drugs such as Aspirin or Nurofen as these occasionally cause unwanted bleeding following the surgery. Ensure you take your antibiotics as prescribed and apply topical ointment and eye drops as instructed. Cleaning the eyes with warm sterile water is useful and the surgeon may advise the use of eye drops. The sutures are usually removed after 5 to 7 days and soon after you will be able to use make-up. Sometimes you will be advised to use the suture strips or steri-strips as support to the lower eyelids for a week or so. The eyes appear watery after surgery, partly because of swelling under the conjunctiva (chemosis) and partly because the tear ducts are swollen and do not drain as readily. This will last a few weeks. Although there is bruising it can quite readily be disguised with make-up and dark glasses. The scars will be pink for a few months, but eventually they become almost invisible. Our eye bag removal surgery, also known as lower blepharoplasty starts at £2750. Contact either our London or Bournemouth Clinic to find out more or arrange for a private consultation.